An offensive by eastern forces on Libyan capital Tripoli stalled in the face of strong resistance and the internationally recognised government said it took almost 200 prisoners. Fighting between Khalifa Haftar’s Libyan National Army (LNA) and troops under the internationally-backed Tripoli government killed at least 56 and forced 8,000 to flee their homes in the city in the last week, the United Nations said. After sweeping up from the south, the LNA bogged down in Tripoli’s southern suburbs. Several locations changed hands more than once. More than 190 LNA troops were captured, officials allied to Tripoli said, accusing it of using teenagers. A total of 116 fighters were captured in Zawiya, west of Tripoli and an additional 75 in Ain Zara officials said. 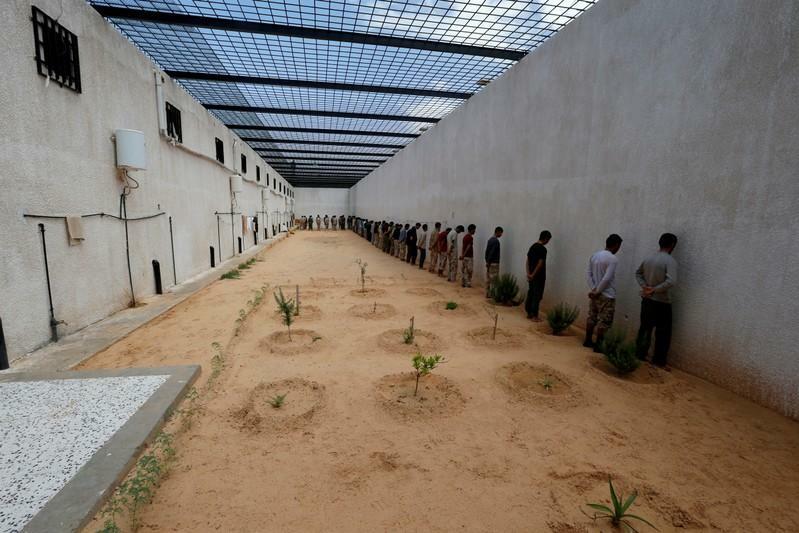 In a prison in Zawiya, Reuters reporters saw prisoners, mostly young men, some wearing civilian clothes, sitting on the floor while others stood facing a wall. In Tripoli, officials brought families displaced by fighting to shelter in schools. Red Crescent workers handed out rations in a school as gunfire clattered in the distance. Haftar’s push on Tripoli is the latest turn in a cycle of factional violence and chaos in Libya dating back to the 2011 uprising that overthrew veteran dictator Muammar Gaddafi. The European Union urged the LNA forces to stop the offensive, agreeing on a statement after France and Italy sparred over how to handle the escalating conflict. “The military attack launched by the LNA on Tripoli and subsequent escalation in and around the capital are endangering civilians, including migrants and refugees, and disrupting the UN-led political process, with the risk of serious consequences for Libya and the wider region, including the terrorist threat,” top EU diplomat, Federica Mogherini, said in a statement. France, with oil assets in eastern Libya, provided military assistance in the past to Haftar in his eastern stronghold, Libyan and French officials say. It was a leading player in the war to unseat Gaddafi. Haftar moved troops from southern and eastern Libya to Tripoli, stretching his lines. Exploiting this, Islamic State’s AMAQ news agency said the Islamist militant group killed six LNA soldiers near Sabha. LNA spokesman Ahmed Mismari confirmed the attack but said there were no casualties on the LNA side. In the latest tally of casualties the UN World Health Organisation (WHO) said 56 people – mainly combatants and civilians including two doctors and an ambulance driver – were killed and another 266 wounded in Tripoli. It was not clear if this included the LNA toll for its soldiers – 28 killed and 92 wounded since the start of the offensive. The number of people forced from their homes by fighting rose to 8,075, the UN migration agency IOM said. The LNA forces swept out of their stronghold in eastern Libya to take the sparsely populated but oil-rich south earlier this year, then headed t Tripoli, where Serraj’s UN-backed government sits. Haftar resisted UN pressure to accept a power-sharing settlement to stabilise the country, using his leverage as a Western ally against militant Islam in North Africa.